The first time I returned to China it was in 1994. At the time I traveled there with my friend Jack, whose village is not far from my own. We spent most of the time in our villages and visited Beijing for about a week, then left China. In the intervening years between this trip and my next I read up on Chinese history. I kept in my mind some of the places that I would like to make an appearance. Seven years later in summer of 2001, I finally returned to China again. And this time I went alone. I had carefully drew up an itinerary and in it was the sacred Daoist mountains of 武当山Wudangshan. I had a special interest in Daoist thoughts and making that visit was a pilgrimage. Wudang Mountains is in the northwest of 湖北Hubei province, between the cities 十堰Shiyan and 丹江口Danjiangkou. Before reaching Wudangshan I was on a 长江Changjiang (Yangzi River) cruise from 重庆Chongqing to 宜昌Yichang, passing the 三峡Three Gorges along the way. From Yichang I took a quick trip to 秭归Bigui to take a look at the colossal dam. Then I moved up to 襄樊Xiangfan. Here I visited 古隆中Gulongzhong — the famed abode of the young 诸葛亮Zhu Geliang, who later became the prime minister and military strategist of the 蜀汉国Shu Han state during the 三国Three Kingdoms Era (220 - 280). It was in 2001 that I visited the Wudang Mountains, and at the time I did not do much written documentations. So all my descriptions here are from memory. I believe this is the 天主峰Tianzhu Feng ( Pillar of Heaven ). I remember many young couples arriving at this sacred mountain top felt the excitement and each pair brought a pad lock from the vendors, who then carved their names on it. The pair would then pick a good spot and lock it on the chains of the stone pillars. It symbolizes everlasting union - that is until the monks decided the rust is getting too ugly or the metals got too much weight. A local woman outside the hotel buildings. A local little girl. There were alot of families living in the Wudang Mountains, and the kids naturally came to play near the temple areas. Wudangshan mountains has 72 peaks. It is safe to say that they are mostly visually calm and tranquil. This could be one reason why the well-known 明朝Ming dynasty (1368-1644) Daoist and martial artist, 张三丰Zhang Sanfeng had a life-long passion for them. One of the more drama view of Wudangshan. When the mist and clouds hover over the mountains, it is otherworldly. Wudangshan has an extraordinary variety of plant life. The great Ming pharmacologist 李时珍Li Shizhen(1518-1593) found 1800 species and recorded them in his great Compendium of Materia Medica, 《本草纲目》Bencao Gangmu. 400 of these were listed as herbs with medical value. Modern survey listed 617. The stone steps in Wudangshan are well kept, unlike those of Huangshan. 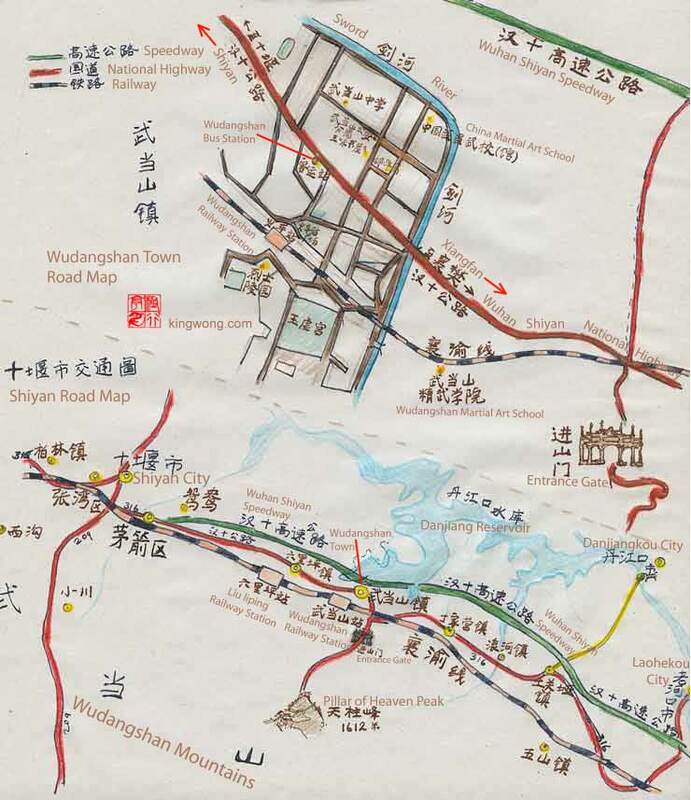 Wudangshan has its own villages. They were just small and the houses were in small groups. At Xiangfan I met a family from Beijing who was uniting with relatives to visit Wudangshan. It was an activity they do annually. They asked me to join them and so I went along, since I didn't know how to get there. We first took a bus to the entrance arch of Wudanshan; then we squeezed in a tiny 面包车Mianbaoche (minibus) to navigate through the narrow mountain roads toward the main mountain. Once there I was persuaded to take the cable up close to its summit, which is the 天柱峰Pillars of Heaven peak — the heightest point of the Wudang mountains, measuring 1612 meters. This peak is celebrated for one important structure — the all bronze 金殿Jindian ( Golden Hall ), which measures 4 meters long, 3 meters wide and six meters high. This is the shrine most people come to burn incense, and my devoted friends spent much of their time in this crowded area. I went off to nearby areas to look around and did a little photography. Although Wudangshan is an UNESCO site, it wasn't as popular as 黄山Huangshan ( Huang Mountain or Yellow Mountain ), so the areas other than the main halls of the temples were quite empty. I did not get to see many of the temples. On the ones I visited I went around the back of the temples and other quiet areas that connects with the landscapes. It was easy to see why Wudangshan stands out as the mountain of choice for Daoists and nature lovers. The landscape is even without too much distortion nor too little drama — it has both flat hills and vertical cliffs. Its uniqueness comes from its wealth of plant life that gives the mountains its lushness and salient appearance, as well as a carefreeness that is well-suited for reclusive reflection. Such a range of wonder could not have escaped attention. And indeed Wudangshan had been admired since before the 秦朝Qin Dynasty (221 BCE - 206 BCE). And during the 汉朝Han Ddynasty (206 BCE - 220 AD) it was officially recorded in the 《汉书》Book of Han. During the subsequent ages, the 72 peaks of the sacred mountain had seen sung by emperors and poets and adventurers. During the 唐朝Tang Dynasty (618 - 907) the 五龙祠Wulong Ci ( Five Dragon Shrine ) was built on its domain. The following dynasties added more architecture, especially during the 明朝Ming Dynasty (1368-1644) when the its building activities reached its sublime. 30,000 troops were ordered by the emperor to construct an unprecedented temple complex. The result was nothing short of a palace — indeed it was the closest thing to a celestial palace. The emperors built the temples and the intellectuals sung over its beauty. The legendary Ming Taijiquan master 张三丰Zhang Sanfeng taught his students here. The great Ming pharmacologist 李时珍Li Shizhen (1518-1593) studied the mountains and found 1800 species which he recorded in his great Compendium of Materia Medica, 《本草纲目》Bencao Gangmu. 400 of these were listed as herbs with medical value. Modern survey listed 617. The pioneer geographer and traveler 徐霞客Xu Xiake (1587 - 1641) was stunned by its beauty and wrote all about it in his great travel books. All this was a reason why I came here as well, and you would wonder at its loaded history, great architectures, and calm landscape as well.